FOURTH YEAR student Justine Kyle Imperial has recently appeared on TV as part of the local shows, Magandang Umaga SoCCSKSargen (MUS) and TV Patrol. 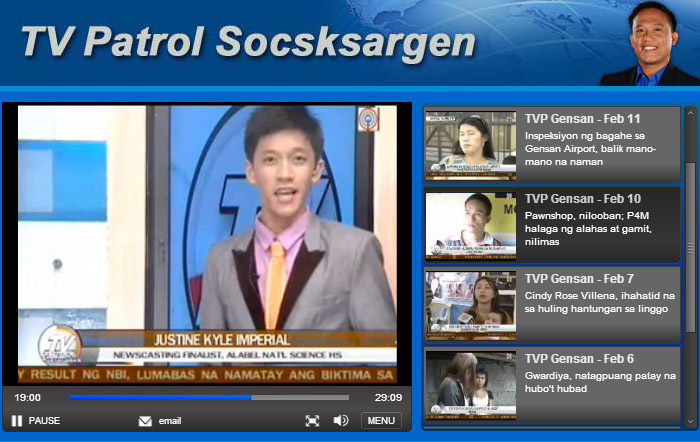 Imperial is one of the ten finalists of the 3rd Newscasting Competition of ABS-CBN General Santos. On the episode that aired on February 10, Imperial took the role as host in the live morning show, MUS, and as anchorman in the afternoon news program, ABS-CBN. You can watch the episode on TV Patrol SoCCSKSarGen website, February 10 episode. “It was one of my memorable experiences. It is really exciting to be on TV for the first time,” Imperial said. The grand finals will be held in March at the Veranza Mall, GenSan. Winners will receive cash prizes, trophies, and a chance to join ABS-CBN News and Current Affairs team. Imperial said that he just enjoys the experience and does not pressure himself to win. Aleli E. Dasmariñas trains Imperial for the competition. Help Justine win the People’s Choice by liking his photo on Facebook. Vote for Justine! Posted in Achievements, News and tagged journalism, newscasting, TV.